Found in the northern forests in North America, Europe, and Russia, moose are the largest member of the deer family. They are at home in the water and despite their staggering bulk, they are good swimmers. The moose is about 5-6 ft (1.5-2 m) tall at the shoulder. Only bulls (males) have antlers and they are shed yearly, then regrow. The largest recorded antler spread is over 6.5 ft (2 m). Moose have hoofed feet, long legs, thick brown fur, a large body, a droopy nose, and a dewlap (a flap of skin hanging loosely from the chin). The moose is an herbivore (a plant-eater) which spends most of the day eating. They have a life span averaging 15-20 years in the wild. 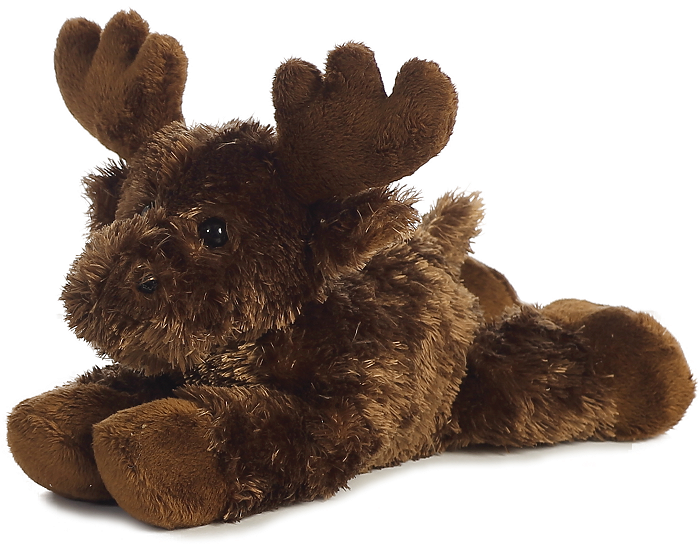 This sweet little stuffed moose has soft brown fur, dark brown antlers, and a sweet smiling face. 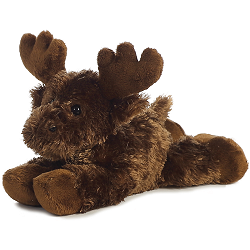 This adorable little plush moose keychain has soft brown fur, blacik accents, and fun beige antlers. Clever, this sweet little plush coyote, has a huggable body of soft brown and light brown fur and warm golden eyes.